I have been longing for a Clarisonic for many years. As you all can imagine, the only factor that's prohibiting me from owning one is the high price tag. I believe that skin care is so important, and one's face care should be a great investment, but I just can't shell out the $195 price tag. Not even for the Clarisonic MIA, which is relatively less expensive. 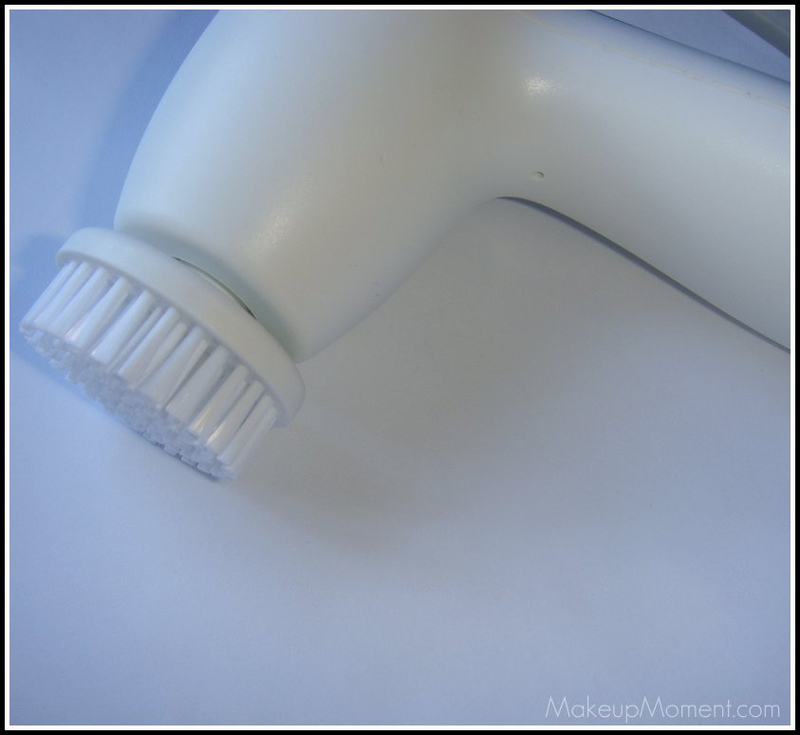 When I got it home, I wanted to immediately put this cleansing brush to the test. I felt like a little kid opening up a present, LOL! That's how excited I was. Before I begin the review, I want to give you all a short background on my skin. I have dry, sensitive, and acne prone skin. Seriously, any new product can trigger acne on my skin-especially if my skin does not agree with it. Whenever my face is having an acne outburst, I rely on a cleanser that contains acne-fighting ingredients. For the most part, I try to be careful with the skincare products that I use, and look for oil-free and gentle, cleansers and scrubs. When I opened the box, included in the kit was a cleansing facial brush, two batteries, and a mini-sized Olay exfoliating renewal cleanser. I first proceeded to insert the two included AA batteries (very nice inclusion), into the cleansing handle. In order to do this, I had to get a good grip and pull apart the handle and the tip of the handle. I admit, I struggled quite a bit. I am sure you are all far less-clumsier than I am, and could probably snap this handle apart in no time. Three minutes later, and the separation was complete. I inserted the batteries, attached the brush head to the sturdy handle (very easy to do-just snap it on), and turned it on. On the handle, you will find two press-on buttons. The larger one on the top, is the on/off button, while the one below that is the 2-speed button. Press it once to make the bristles rotate slower, or press a second time to make the bristles rotate a bit faster. I really like this 2-speed feature a lot. It is always a good thing when we have options available, that better suit our different skin needs, and unique tolerance levels. I always wondered if just using my hands to clean my face, was actually really effective at removing all the makeup and gunk on it. It may be, but I think my skin was craving a little more TLC when it came to a deeper cleansing experience. I tried this product with a number of cleansers. I am pretty sure that any cleanser of your choosing, will work just fine along with this system. I did use it with the included mini-sized Olay Pro X Exfoliating Renewal Cleanser, and it did a good job at cleansing and making my face feel clean. It did not cause my skin to react, and I did not detect a strong fragrance. But, I don't think this cleanser is anything special for it to warrant a full size purchase. The sample inclusion was a nice touch, though. 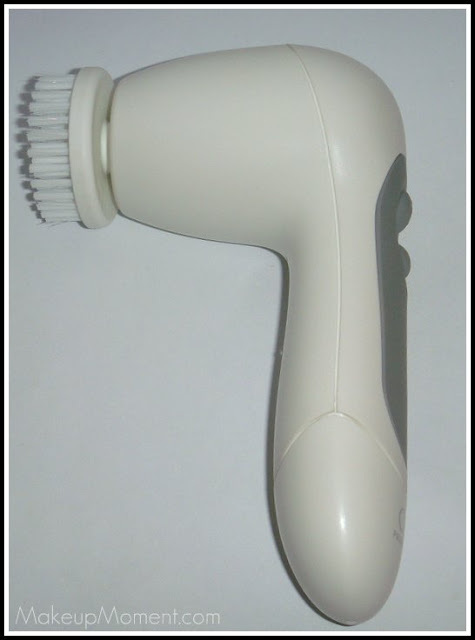 There are two cleansers that I alternate between, while using this cleansing system. 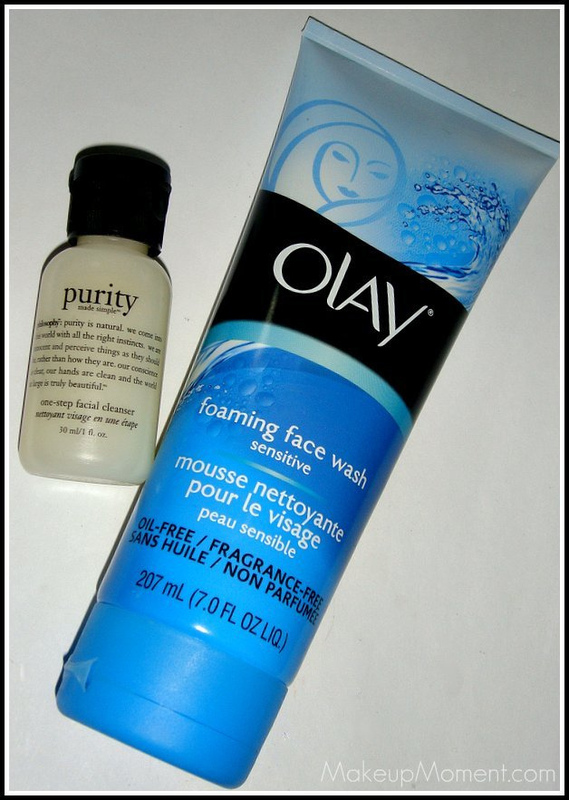 The first one is the Philosophy Purity Made Simple Cleanser, and the second one is the Olay Foaming Face Wash (Sensitive Skin). The later is the cleanser that I enjoy the most. Both cleansers are gentle on my skin, and I feel that along with this Olay cleansing system, both do a great job deep cleaning my face and really taking it to another level. Now, let's talk about how I put this cleansing system to use. First, I splash my face with some warm water and massage the cleanser all over my face with my hands. Then, I take the Olay cleansing brush and wet it with water (don't worry, the system is water-resistant), and start moving the spinning brush around my face in circular motions for about 1 minute or so. My speed preference is the gentler/slower setting. I have experimented with the faster speed and it works just as well, but I prefer the slower speed just because my skin is super sensitive. While rotating, the bristles do not feel rough on my skin, and the they allow flexibility which is always nice. I have to say that the brush does a great job at lifting all of the gunk off of my face. After I am done cleansing, I rinse my face with warm water and pat dry. I use the cleansing system twice a day, morning and night. Before I start cleansing, I remove my makeup with a makeup removing cleansing cloth, and you would think that is enough to get all of your makeup off. But it really isn't. 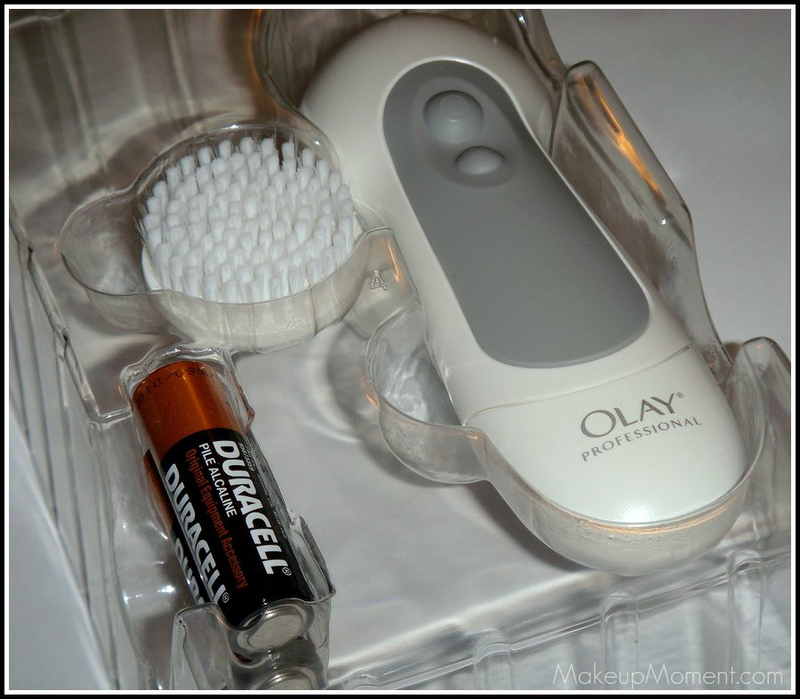 I am amazed at how much leftover makeup appears on the Olay cleansing brush, after I am done using it. I really feel that I am getting a really deep down-to-the pore cleaning with this system. And I am really happy about that. After use, I just rinse the brush with some warm water, and I make sure to use an anti-bacterial soap to quickly disinfect the bristles. Olay recommends replacing the brush head every 3 months, or so. The replacement brush heads are not really expensive. If I remember correctly, I spotted a 2-pack for $11? After I rinse my face, I can immediately tell the difference on my skin. My face feels so much smoother, cleaner, fresher....like it can breathe! I have not been breaking out as much as usual, my skin tone is much more even, and my moisturizer really does absorb into my skin better. When it comes to my pores, I really don't notice much of a difference in size, but they do feel a bit cleaner. I have had nothing but great experiences with this system. I'm even going to go far, as to say that it has made a great impact on my skin. I have only been using this cleansing system for about 2 weeks. But I really believe that my skin will keep on improving. If anything goes wrong down the road, I will be sure to update this post. 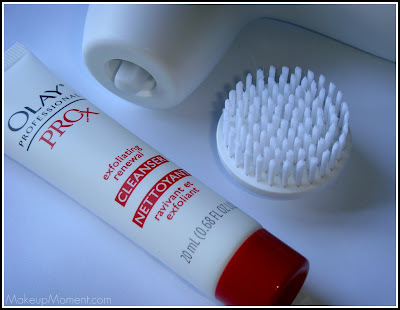 But as of now, the future looks bright for my skin, thanks to the Olay Professional Pro X Advanced Cleansing System. Although I LOVE this Olay cleansing system, there are a few issues I encountered. First, the semi-struggle to pull apart the handle to insert the batteries. But I digress-since it was totally worth it. Next, I really like the clean and simple look of the system, it would be really cool if more color options were available. I like simple, but I am a sucker for color. Also, the inclusion of a brush stand would have really been more practical. Boo! Lastly, I wish the system was a little more less-noisy. When the brush spins, it's such an annoying buzz-like sound. The noise actually reminds me of a tooth drill that dentists use *shivers*. I don't know if this noise thing is something that can't be helped, but a more soothing sound would have been more preferred. 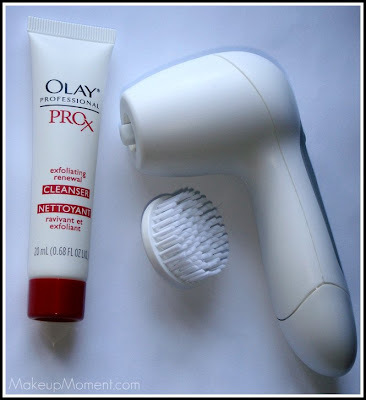 Overall, I totally recommend this cleansing system from Olay. It is simply amazing, and you cant beat the affordable price. I can't rave about it enough. I want to mention that, everybody's skin is different. And what works for me, may not work for someone else. But, I still think this product is worth a try. Maybe in the future I will actually have the means to shell out the money for a Clarisonic, but I don't think it will happen anytime soon because, Olay has made me a very happy girl. Score! 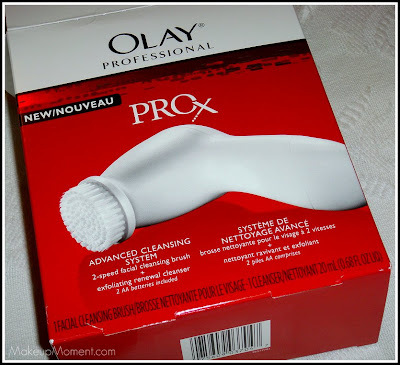 What do you all think of the Olay Professional Pro X Advanced Cleansing System? Have any of you tried it? Thinking of trying it? Please, share in the comments! I agree with you, Serafia! The makeup wipes are not enough to remove makeup. I admit, I used to rely on just makeup wipes before, but I came to the conclusion that it wasn't really good for my skin. Now, I make sure to use a cleanser along with this Olay system, to really get the makeup off.